Gautam Naik, The Wall Street Journal, September 25, 1996. Ever wonder why certain shampoos have just the right consistency, so they flow from the bottle but not through your fingers? Or why a particular soft drink seems to hit the spot, while another may not? Or how cyclists could shatter 21 speed records at Atlanta's Summer Olympic Games? The answer in each case: mathematics. Or, more precisely, Mathematica, an obscure and high-powered software program that lets computer novices crunch mind-numbing technical computations with the ease of using a calculator. 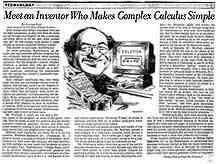 For the program's creator, Stephen Wolfram, a physics whiz who got bored of academia and reinvented himself as a software salesman, converting the complicated into the simple has yielded a handsome business opportunity. Most ordinary Americans may hate doing math, but they are increasingly subject to its influence, whether they know it or not. Experts in a growing number of fields are relying on calculation rather than estimation. Some textile designers use geometry to create pleasing new designs. Many companies have discarded rule of thumb in favor of sophisticated statistical tools to decide what products to place on supermarket shelves. Even musicians use math equations to generate inventive new sounds. Mathematica has been used in each of these cases. Mr. Wolfram, 37 years old, has sold a million copies of the program, at about $1,300 apiece, since 1988. Now he hopes to push his program to a far broader audience—financial analysts, doctors and even high-school students—aiming to give them access to computational power that only programmers had previously. Whether such neophytes are ready for it is the big question. Wolfram Research Inc., Champaign, Ill., is about to launch a souped-up version of the product, Mathematica 3.0. Next week, the company will start distributing free samples to new users and hundreds of schools and colleges. Two "MathMobiles"—Dodge Rams, painted in colorful Mathematica-generated graphics and equipped with several computers—will embark on cross-country promotional tours in the U.S. and Europe. A new and related application, Technical Trader, is aimed at technical analysts who try to predict stock-price movement by using sophisticated models. If the new stuff can appeal beyond a core market of four million scientists and engineers, Mr. Wolfram, already a rare example of a millionaire scientist, could become a much wealthier man. "We'd better get it right," he mutters as he taps away on a computer, trying to fix a bug. "Or all the world's going to get its arithmetic wrong." Mr. Wolfram is widely described as one of the world's smartest researchers, an intensely focused man who has never been known to suffer fools gladly. Despite his growing business, he is ever the eccentric scientist, often working all night and waking at noon. Running his company via cell-phone, pager and e-mail, he spends most of his time in Chicago along with his mathematician wife and nine-month-old son. But his freewheeling days as an academic are gone: He no longer picks vacation destinations by simply showing up at the airport and buying a ticket to whichever destination appears at the top line of the departure board. Born in England, Mr. Wolfram attended Eton and Oxford but was so far ahead of his peers that he never bothered to graduate from either. That didn't stop him from receiving a Ph.D. in physics—in one year—from the California Institute of Technology at the age of 20, or from winning a MacArthur "genius" award at 21, the youngest-ever recipient. After a stint at the Institute for Advanced Study in Princeton, N.J., he founded a research center at the University of Illinois, Urbana-Champaign. Its main purpose was to unravel a hotly pursued question: Can complex patterns in nature be traced to a few simple—but still elusive—rules? Mr. Wolfram created Mathematica to help him search for an answer. (He says he has found it and is writing a book on his discovery.) But he hated academia. It was "the worst of both worlds," he says: Unlike business, it was often "aimless," and even good discoveries were likely to end up unread in obscure research papers. So Mr. Wolfram founded his own company in 1988 to sell his tools to fellow scientists. Mathematica does have some dazzling powers. It can spit out the first 2,550 places of pi in a split second. It took a mathematician working at Wolfram Research two hours and five pages of computation to solve one calculus equation: Mathematica solved it in one-twentieth of a second. And the program can generate elaborate three-dimensional graphics that are easy to manipulate in hundreds of ways, a claim rival products can't match. These features prompted scientists at Helene Curtis Industries Inc. to use Mathematica to understand how shampoo molecules interact so that the liquid would have the right consistency. Flow is dictated by molecules' shape (long, thin chains are best), and Mathematica was able to model their optimal geometry. Chemical engineers at International Flavors & Fragrances Inc. build math models with the program to predict the interaction among chemicals, helping them pinpoint a pleasing food flavor. And Dun & Bradstreet Corp. relies on the software to calculate its Nielsen ratings for television shows. Mathematica was also used to design the Atlanta Olympics cycling arena entirely on a computer. About 235 massive chunks of steel, each with a unique shape, were built to snap together and come apart just as easily—essentially, a transportable velodrome. "Previously engineers would use a trial-and-error method" to plot curves and slopes that would yield the highest speeds, notes Chris Nadovich, chief engineer for the Atlanta project. He used Mathematica and a complex algorithm it crunches—called Fresnel Integrals—to design a 3-D version of the structure on the computer screen "down to every nut and screw." The mathematical precision yielded a surface ideal for record-breaking speed. Seth Chandler, a law professor at the University of Houston, uses Mathematica to represent, and then solve, insurance-law scenarios on drunk driving that are so complex they can be described only mathematically. It lets him manipulate a wide range of variables—driver experience, age, seat-belt usage, time of day, and still others—to calculate the optimum exposure an insurer should bear in hundreds of different situations. Calculus problems occur everywhere, Prof. Chandler says: "Did you know that the amortization of a home mortgage is actually the solution to a differential equation—and one that Mathematica can solve in the blink of an eye?" Jerry Uhl, a math professor at the University of Illinois, teaches calculus to 2,500 students spread across the country; the entire course, including text, is written for students with Mathematica, and shipped over the Internet. Many old-line calculus teachers decry this trend. They lament that Mathematica yields answers without requiring students to crunch the numbers themselves, much as a pocket calculator lets a grade schooler get answers without having to learn long division. "It's a silly controversy. I never learned long division, and look at me," Mr. Wolfram says contemptuously. "If you start off doing everything by hand, you'll never get anywhere."